Do you need to collect website data into database, spreadsheet or any other format? Sometimes it would be great to obtain some data from websites. Websites don’t always provide their data in comfortable formats such as CSV, XML or JSON. You can collect the websites data in any format with ease using the technique called web scraping. Web scraping is the act or process of retrieving information from the World Wide Web or Websites. Essentially, this is done with software that mimics human web surfing to gather particular information from different websites. 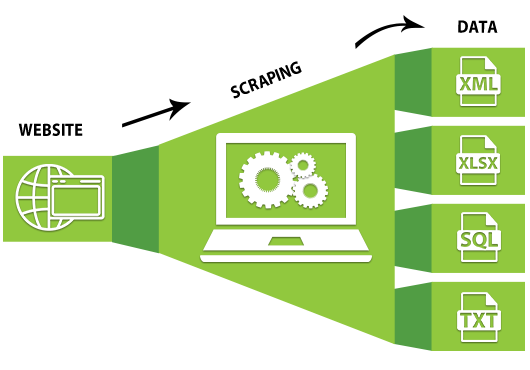 Web scraping is also known as Web data extraction, Screen Scraping or Web harvesting. Recently, various advanced web scraping techniques and methods have been developed like text processing, artificial intelligence, human computer interactions, DOM parsing, computer vision and natural language processing to simulate the human browsing that occurs when viewing a webpage to automatically collect data from a website. A tool or software developed for web scraping is known as Web Scraper. Those are softwares developed to collect data from a website via ETL (Extract-Transform-Load) technique usually with the help of programming language like Java, Python, Ruby, PHP, .NET etc. Web Scrapers are also known as Web Data Extractor, Data Harvester, Web Crawler, Bot, and so on, most of them are standalone desktop applications, web applications or cloud applications. Collect latest stock-market quotations and exchange rates. Extract leads from online business directories for example yelp scraping, yellowpages scraping, whitepages scraping, manta scraping etc. Collect search engine rankings for SEO purpose. Extract meta information(description, keywords, page title) on pages of a website. Collect price, quantity, item name, description, etc., from a supplier’s website. Collect information from journal websites and encyclopedia. Scrape retailer websites on a regular basis. The list is endless. There are countless web scraping uses and applications, either business-oriented or non-profit.